A 2-year-old intact male Golden Retriever was presented for a detailed cardiology workup due to a loud systolic murmur detected on routine physical exam. The dog did not show any clinical symptoms at this time, amazingly, he was in very good condition: alert, loved to play with other dogs, and had a good appetite. He did not receive any medication. Clinically, he had a grade 4/6 systolic heart murmur with a PMI on the left side at the level of his heart base as well as a soft diastolic murmur at the same site. His heart rate and respiratory rate were normal, his mucous membranes were pink. 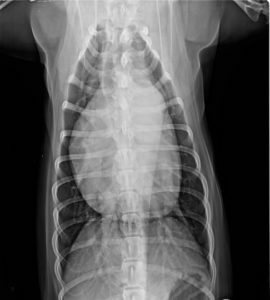 Thoracic radiographs showed a generalized cardiomegaly (Vertebral Heart Score 12.5) and a prominent aortic segment. Moreover, on VD-views, the pulmonary vessels were prominent. The lung field displayed a mildly vascular pattern, but no evidence of left sided congestive heart failure. Eyeballing the left parasternal 4-chamber view, one could get the impression that there is not very much pathology present – only some right ventricular concentric hypertrophy and mild left atrial enlargement. The proportions of the left ventricle do not seem to be very abnormal at the first glance. Yet, this would be in conflict with the cardiac silhouette as it appears on the radiographs. Looking a bit closer at the dimensions, the left ventricular diastolic diameter is borderline normal (Cornell-Index 1.8 – should be <1.85 in large breed dogs) and the septal as well as free wall thickness are unequivocally increased (Cornell-Index 0.7 – should be below 0.6). In Summarizing, there is left ventricular pressure- and volume overload as well as right ventricular pressure overload present. The mitral valve leaflets do not separate properly in diastole, the tips are kinked towards the center. The decreased separation can be seen much better in parallel plane (dropping the transducer cable a bit towards the table). Color flow across the mitral valve shows mild regurgitation. On 5-chamber views, the mobility of the aortic valve leaflet is clearly restricted. It is clearly visible that the left coronary cusp does not entirely open. 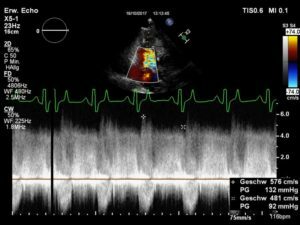 Doppler derived gradients across the aortic valve were slightly above 4.5 m/s. Looking at the pulmonic valve in a short axis view, impaired separation of the cusps during systole can be easily recognized. This creates a pressure gradient of 3.6 m/s, which is indicative of moderate pulmonic stenosis. 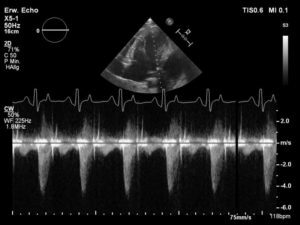 A deeper look into the pulmonary artery including color Doppler imaging reveals a diastolic flow from an ampulla-like vessel into the main pulmonary artery. Systolic flow cannot be exactly evaluated because of the turbulence caused by pulmonic and aortic stenosis. Still, the appearance is typical of a PDA. The maximum pressure gradient across the PDA is 5.7 m/s (high normal). PDA, valvular aortic stenosis, valvular pulmonic stenosis and mitral dysplasia. How do all these defects interact in one single heart? The mitral valve dysplasia is mild – there is not much regurgitation and not much stenosis present. So, the left atrial enlargement is certainly caused by the PDA. The aortic valve dysplasia creates a stenosis. Still, a large PDA very likely contributes to that stenosis by increasing the diastolic volume of the left ventricle (which has to leave the ventricle through the aortic valve in systole, creating a so called pseudo-stenosis – a stenosis caused by increased volume, not by a reduced diameter). The stenosis is responsible for the thickening of the left ventricular myocardium. The pulmonic stenosis causes right ventricular concentric hypertrophy. Contributing pulmonary hypertension is very unlikely due to the high normal pressure gradient across the PDA. The pressure gradient across the PDA is high normal – On possible explanation would be a mildly decreased pressure within the pulmonary artery due to the pulmonic stenosis. There is reason to assume that the pulmonic stenosis is responsible for the fact that Gordon’s heart has not yet decompensated, meaning that pulmonic stenosis saves him from pulmonary edema. Due to the fact that Gordon did not show any clinical signs of cardiac disease, no medication was prescribed. At the time of this case, catheter-based closure of the PDA and balloon dilation of the pulmonic valve was discussed with the owners but no decision had been made yet.